Wrexham football club boosted by cash snatched from criminals | News by Wales Express News, People Before Profit! A Wrexham football club which tackles mental health problems, discrimination and homelessness has netted a £2,500 windfall – thanks to cash confiscated from crooks. Wrexham Inclusion Football Club was formed in Acrefair last autumn to support people with disabilities, mental health issues, ADHD, autism and also those from ethnic minority or LGBT groups or who have been affected by bullying or homelessness. Although the club kicked off by using football as a way of helping people to meet and have fun, it has now extended into arranging volunteering and adult learning opportunities for its growing band of service users. 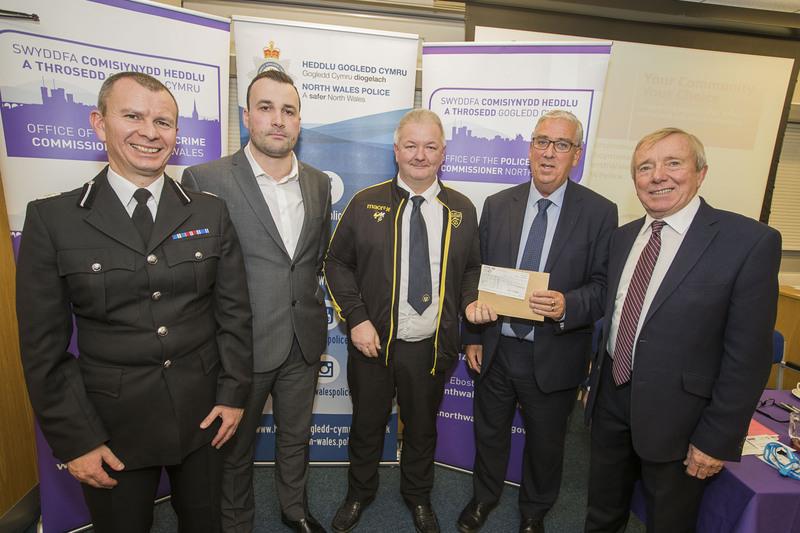 Your Community Your Choice grants Assistant Chief Constable Richard Debicki, Rhosllanerchrugog Football Club’s David Maddocks and Michael McLellan, North Wales Police and Crime Commissioner Arfon Jones and PACT Chairman David Williams. It has started a Build the Bus campaign to buy a 17-seater minibus and this has now received a grant of £2,500 from a special fund distributed by North Wales Police and Crime Commissioner Arfon Jones. The Your Community, Your Choice initiative is also supported by the North Wales Police and Community Trust (PACT) which is celebrating its 20th anniversary in 2018. It is the fifth year of the awards scheme and much of over £160,000 handed out to deserving causes in that time has been recovered through the Proceeds of Crime Act, using cash seized from offenders with the rest coming from the Police and Crime Commissioner. This year there are 14 grants totalling almost £40,000 given to support schemes by community organisations with an online vote deciding the successful applicants from among 35 projects submitted and almost 10,000 votes cast. At the Your Community, Your Choice presentation ceremony at North Wales Police headquarters in Colwyn Bay, the club’s general manager Wayne Greenshields said: “We’ve grown very quickly and we estimate that by the end of this year we’ll have over 100 active players making us the largest community-based football mental health team in the UK and also one of the most successful. “Every week we support over 50 people aged 11 to 60-plus, giving them a voice and a platform where their previous history will not be judged but where difference and change are celebrated. “It all started off with football and things have now gone much further into areas such as volunteering where, for instance, we worked on the garden of a local disability centre, and adult learning where we offer language classes and healthy eating courses. “The club is led by volunteers and we work closely with schools and other local organisations. “On the football front we drove the players over 17,000 miles to tournaments up and down the country, mostly in the private cars of our volunteers, so receiving the grant from Your Community Your Choice will give us a massive boost. The county of Wrexham’s other successful scheme is Rhosllanerchrugog Football Club, which has received a grant of £2,500. The club uses football and a range of social activities to promote inclusion amongst male, females, ethnic groups and the disabled. The grant will enable them to further develop their work by providing equipment and other resources. Club secretary Mike McLellan, who with local councillor David Maddocks has been a driving force behind the scheme, said: “We started from scratch only last summer so this grant will be a big boost for us. “We’ll use it to buy kits and to cover other expenses such as coach travel, team registrations and storage facilities near the pitch. “We launched the club through social media and we didn’t realise how successful we would become as we’re now getting around 60 kids turning up for sessions. “Our aim is work in partnership with local police officers and to go beyond football by inviting young people to the local community centre for talks on subjects such as improving the area, staying away from anti-social behaviour and litter control. 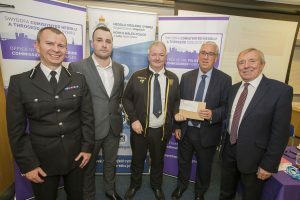 North Wales Police and Crime Commissioner Arfon Jones, who jointly presented the awards with Assistant Chief Constable Richard Debicki, said: “I am delighted that my Your Community Your Choice fund continues to support community projects across north Wales for a sixth consecutive year. “I recently launched my Social Value Policy which seeks to expand our support to local communities and ‘Your Community Your Choice’ provides me with an opportunity to do just that. “This unique fund allows our communities to decide which projects should get financial support and the response showed that communities can work together to make our public places safer. “I have visited a number of last year’s successful projects and have been extremely impressed with the work done to ensure that our communities continue to be some of the safest places to live, work and visit in the UK. Assistant Chief Constable Richard Debicki said: “The funding which you have received has been made available by the Police and Crime Commissioner and through assets seized from criminals under the Proceeds of Crime Act. “This is a particularly vital message as, through the professionalism of North Wales Police Officers and with the support of the Courts, we are able to hit the criminals where it hurts – in their pockets. “This is the fifth year of Your Community Your Choice funding and during this time North Wales Police has recovered £2.3 million of cash and assets with £627,000 coming back to North Wales from the Home Office to support schemes such as this. PACT chairman David Williams added: “We are delighted that we can assist in the administration of this fund. “I think the breadth of our grant giving right across North Wales, from the tip of the west to the furthest part of the east, really sends a strong message to communities to access this money, it’s there for them. “Very appropriately, one of the conditions is that the people who apply for this money have to be doing something that combats anti-social behaviour or addresses crime and disorder in some way.